We're going to go over the Event List Widget in this tutorial, including how to configure it, things to expect from it, and perhaps some tips and tricks you can use at your next cocktail party. You'll be the star of the show, for sure. The first thing to note is about the Event List widget is where to find it. The widget comes packaged with the core version of The Events Calendar. You'll find it Appearance > Widgets from the WordPress dashboard. Drag that little guy into the sidebar area of your choice, and you're off to the races! Title: This is the heading that sits above the widget. By default, this is "Upcoming Events" but it can be changed to anything you'd like. Show: This is the maximum number of events you want to display at any given time. Five is the default, but this can be any number between one and ten. Show widget only if there are upcoming events: Check the box for this option and the widget will automatically hide itself if there are no events forthcoming. Otherwise, it will display a handy notice saying there are no upcoming events at this time. Limit to featured events only: Check the box for this option and the widget will display featured events. Generate JSON-LD data: Enable this setting if you would like to enable structured data in the widget. Structured data is what search engines use to recognize calendar content on and display events in the search results if the data is there and processed by the search engine. It's important to bear in mind that the Event List widget in The Events Calendar PRO is the same widget that comes with the core version of The Events Calendar. If you have PRO, you'll see the same Event List widget under Appearance > Widgets. This time, however, you'll see some visual differences and more available options that allow us to customize the widget further. Phew, that's a lot of stuff! You really have a lot of options here to customize the widget's content without touching a line of code and that's awesome. We actually have another tutorial that provides a specific example of how to customize the Event List widget, as well as an entire Themer's Guide on how template overrides work in The Events Calendar. Still, it's helpful to know what files to look for and what they do. The process for customizing the widget in Events Calendar PRO is very similar. The difference is how many files there are and where you find them. 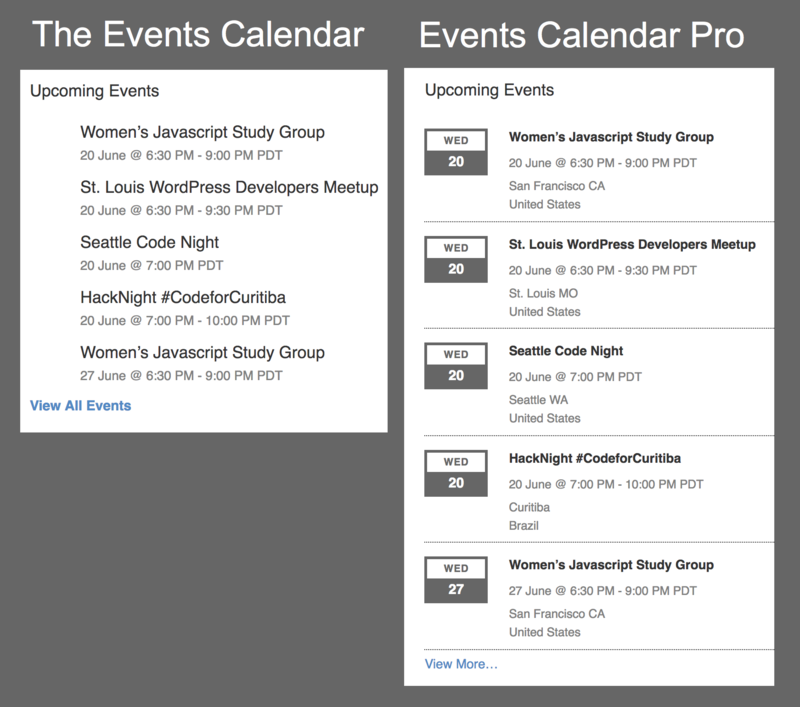 First off, you can find the primary template at: /plugins/events-calendar-pro/src/views/pro/widgets/list-widget.php. Open that up and you'll see that the template actually includes another template called single-event.php which can be found in the modules folder in the same directory as the template. If you were modifying the single-event.php template, you would create one last folder after widgets called modules and then drop the file in there instead (example: wp-content/themes/YOUR_THEME/tribe-events/pro/widgets/modules/single-event.php). There we go! We covered a lot of ground in this tutorial. Hopefully, now you've got a better understanding of the Event List widget, how to configure it, how PRO extends it, and how to customize its templates. Still have some burning questions not covered here? Hit us up at our help desk and we'd be happy to help.